The role of influence is changing and diversifying and with it, the rules and responsibilities of engagement are also reshaping. While PR, analyst, and investor relations were clear yesterday, the rise of new influencers, tastemakers and authoritative users and customers becomes both pervasive and uncertain. As such, new opportunities for engagement emerge; creating new opportunities for cultivating distributed relationships. However, each new connection requires management, a support infrastructure, including a dedicated host. The democratization of content production, publishing and distribution has extended the authoritative legacy of existing experts (media, analysts, pundits, online reporters) and also paved the way for a new genre of savants to join the fray. The social Web thus introduced a democratized content production and distribution and set the stage for the equalization of influence. Eventually however, consumers and decision makers found it increasingly difficult to maintain the division between fact and conjecture and authority and popularity, and thus the lines of authority blurred and only continue to cloud the delineation between past, present, and future influence. Suddenly pundits were sharing opinions, observations, and experiences that directly aligned with the greater markets they represented. As any audience will usually read more than it publishes, arguably to a participation inequality ratio of 90-9-1 (where 9% contribute content sometimes and 1% all the time), these new voices could and did earn prominence and attention. Similar to the consumer experience, these new influencers also made it very difficult for PR and AR to segment the clear boundaries between influencers, or more simply, press and analysts. The ability to shape and shift messages was suddenly distributed and therefore required an expansion in attention and outreach. Influence was not only democratized, it was and is omnipresent. Influence as I define it, is the ability to inspire action and also measure it. New influence is transformative. And as such, the minimum ante to participate now increases the commitment and the human investment. The implications for who, how, and when PR/AR targets suddenly multiplies and at first blush, appears incomprehensible and unscalable. However, it must be addressed, supported, and organized as the landscape for possible influencers is beyond the reach of most businesses as structured today. Therefore, we have to establish filters to qualify influence and also segment them within our organizations to know who is responsible for maintaining relationships – at every level, traditional and unorthodox. As new players emerge, a grey zone soon follows, creating an air of confusion as to which group, team, or individual owns these seemingly ambiguous relationships. Does this dialogue fall under PR, analyst relations, or is a new segment necessary to embrace these tastemakers, who aren’t any less important to our business just because they’re not necessarily tracked and categorized in our media databases? There isn’t a right answer, only that it needs to be addressed, assigned, and fostered. After all PR does not stand for publicity nor does narrowly represent media or analyst relations. This is about Public Relations and therefore socialized media is merely surfacing public sentiment, questions, concerns, advice, and vision and many are earning prominence with every tweet, post, and social object. Jeremiah Owyang was the community manager for Hitachi Data Systems where he earned influence as an avid blogger discussing Social Media, new enterprise marketing, and community focused Web strategy. He later joined Podtech, then Forrester as a senior analyst covering social computing, and is now researching, evaluating, and recommending emerging technology at Altimeter Group with Charlene Li. He is also now covering CMO-level marketing trends for Forbes. Robert Scoble earned prominence at Microsoft’s Channel 9, garnered greater significance at Podtech, Fast Company, The Gillmor Gang, and now continues to generate market shifting content on his personal blog as well as at Rackspace and Building 43. Harry McCracken held the prestigious position of Editor-in-Chief at PC World, but ultimately resigned this position to start his own blog, Technologizer and thus, created his own path to market significance. Charlene Li earned significant stature in her nine years as an analyst at Forrester and recently founded Altimeter where her importance only continues to grow. Just to shake things up, Josh Bernoff is an analyst and Senior VP at Forrester, but he’s also a blogger. He shares his observations outside of his reports and in the process, he shapes opinions and decisions. And, perhaps the most significant collection of influential voices that we have yet to recognize are those of Trust Agents who impact the decisions of our peers, customers, stakeholders, and experts. These individuals usually fall from view of most communications team unless it’s clear that the person is a reporter, blogger, analyst, or customer. Honestly, this list is long and I could write a book on this subject alone (maybe some day I will). But let’s focus on transformation required outside and within organizations to ensure that we no longer miss the opportunities that exist and materialize before us. As I suggest in my call for a formal shift from CRM and sCRM to SRM, we recognize that all people, no matter what system they use, are equal. It represents a wider scope of active listening and participation across the full spectrum of influence mapped to specific department representatives within the organization using various lenses for which to identify individuals where and how they interact. Whether a movement is ignited in its intention or deed, if a public statement or reaction is published and notable activity ensues, we are witnessing influence in action. Thus, in the new world of influence, we must take into account those who might not necessarily appear in our traditional media databases or CRM systems, but also those who frequently earn visibility in new media dashboards such as Collecta, Search.Twitter.com, Google Blog Search, Technorati, BackType, Radian6, Social Media Metrics, DNA13, BuzzGain, TweetMeme, Twitter Lists, etc. This category includes traditional reporters, analysts, financial analysts, A-list bloggers (who are now almost visually indistinguishable from the online media properties that they compete against – for a quick glimpse, just take a look at the Technorati 100), as well as industry pundits who have arisen as a direct result of their investment in new media engagement. Although they are mostly indiscernible by the untrained eye, the principles, methodologies, and processes governing these properties are as similar as newspapers and Twitter. These individuals are interested in breaking news and concrete trends and are respected for their views. With every new update or post, activity usually ensues to the extent of hundreds, thousands, and tens of thousands of clicks and reactions. Magic Middle bloggers maintain a consistent set of inbound links based on their views, research, and experience, but are usually pundits or tech experts who share their experiences with their peers. While the A-list reaches hundreds of thousands or millions of people, this group reaches a much more focused subset of readers usually in the thousands. It can be argued that while they achieve a lower volume of immediate resonance, their stories tend to reverberate deeper with peers and decision makers. The Magic Middle maintains a proud and protected sense of responsibility for what they share with their audiences. Every industry is experiencing the metamorphosis of leverage as individuals define and redefine the landscape with every move they make. They are there now, shaping the perception of brands and trends with or without your involvement now. However, tastemakers (Trust Agents) are also omnipresent and their platforms for influence may extend beyond blogs, as they build communities in social networks and other online forums. A blog is no longer a prerequisite in establishing authority. New networks equally trigger an influential effect in consumer behavior, whether it’s B2B, B2C, government/politics, non-profit, et al. Truth is that tastemakers have always maintained a prominent role in the direction of markets, they’re just more readily discoverable and reachable in the realm of new media. Their behavior and impact is discoverable through new media monitoring tools as well as the search boxes resident in every network. Typically PR and communications are responsible for publicity and media relations, generating coverage and presence in and around news. Analyst relations, if the company was large enough to warrant a dedicated person or team, concentrated efforts on researchers covering the industry in the attempt to gain greater visibility and position within the reports commissioned or purchased by potential buyers. But, what happens when an analyst is also a blogger? Who contacts a customer who blogs or actively posts on Facebook or Twitter? Which division is responsible for embracing someone whose opinions reverberate within pockets of leverage, but their level of authority falls below the A-list threshold? Which team is responsible for the activity that doesn’t fall in any of the categories above, yet maintains an active presence in your industry? These questions require immediate answers as their eminence only continues to amplify. While the answers will differ among brands, agencies, and consultants, the prevailing reaction will be one of ultimate compliance. 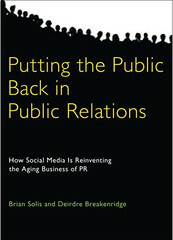 We must now view PR as a true and literal role of Public Relations. We shift from an event-driven capacity of pitching and placing to a position of engagement. Once we acquiesce to the inevitable, we will quickly learn that the existing tools we use for engagement today are grossly inadequate and meaningless. Our portfolio of press releases, q&a’s, messaging documents, features/benefits statements, only create a superficial dimension. And while transparency and authenticity are characteristics required for genuine participation, believability is paramount. It is this notion of conveying credibility that serves as the foundation for trust and ultimately establishes the propensity for digesting and sharing information with peers across social graphs. Believability directly equates to attention, interest, and motion. When combined with fervor and commitment, everything tied to exchanges becomes contagious. Without it, we are forever relegated to information gatekeepers who prevent the real-time exchange of answers and direction. In order to merit and justify this confidence and loyalty, we must become the people we wish to reach and thus immerse ourselves in their perspective understanding their challenges, opportunities, choices, and also their channels of influence. Each of these groups are identifiable through the research performed by using the Conversation Prism and the Conversation Index, however, extra steps are required to determine patterns of coverage and also to establish the influencer hierarchy in which they’re ranked and qualified. In the end, regardless of background, influence fuses our targets and also increases the list of prospects for Public Relations. What remains constant however is that the role of communications as it relates to the business of the brand and influencer, is ultimately dividable based on existing relationships and also the intent of the interaction and exchange. Whether we are seeking news coverage, a discussion of trends and solutions, sharing promotions, engendering community spirit, influencing decision, it is our responsibility to establish guidelines and standards that make it absolute in terms of influencer recognition and who’s responsible for the engagement in a variety of traditional and emerging scenarios. Black and white gives way to a vibrant and dynamic ecosystem defined by grayscale. In order to assess and determine who we introduce into our communications process requires that we first acknowledge that our sphere of influence is much more magnificent than we realize today. Therefore, active research, collaboration and planning ultimately defines how, when, where, and who we interact with and why our conversations and outreach are worthy of attention. Before we can communicate externally, we must first establish a system for frictionless and streamlined communication and cooperation within. It’s about documenting the shift from reporter, analyst, and blogger to a new genre of influencers. This is the era of catalysts, influential people who can cause action or change. I believe that people are still having a hard time discerning between fact and conjecture, and mistake popularity for authority. The social Web seems to be built on popularity, and finding authoritative, factual content is increasingly difficult amid the noise. There certainly are interesting conversations occurring out here, but people are left to their own devices to determine veracity. The list of people you cite along with their bone fides are surely interesting people, with much to offer in their realms of expertise. There are far too many, however, who will use their popularity and the crafted perception of authority in service of manipulation — just as in mainstream media, marketing and PR. The “wisdom of crowds” takes time to coalesce — at any given time, one must practice caveat emptor — as members of the social Web use experience to determine meaning. What are the ethical challenges here? We are asked to accept that everyone a) is honest; b) wants to do right, and c) has their audiences' interest at heart. Again, in the modern media age, this is similar in MSM, though “most” media will get two out of three on this question. Regarding the PR role — provided we in the practice see our role as a managed effort to protect, defend, improve and elevate our organizational reputation, we will continue to have a meaningful role. If we become interchangeable with marketing (exchange theory now), we will fail. Thanks for a thoughtful post, especially in our 140 character age. Great insight, as always Brian. I think many nonprofit associations are for the first time dealing with new voices and bloggers stating what they like or dislike about their membership and association offerings. Many association leaders are not used to having a public discourse on their services and programs, much less having crowds gather around new thought leaders that aren’t on their Boards or writing for their trade publication. They are used to closed door, invitation-only criticism, held at bay. And smaller nonprofit organizations often don't even have communications or pr members on staff. Similarly, conference organizers now face a host of new influencers rather than just the established trade publication or media reporter. Traditionally, the media was held at bay from many conference functions, with media passes to only specific offerings. Now, every one of the conference’s attendees have the tools to broadcast their likes, dislikes and expectations from the conference floor. And many more people read those attendee messages. Conference organizers now see their event brands being shaped by attendees who publicize their experiences. Ironically, attendees should have been shaping those conference brands from the beginning. These are unique times indeed with a host of new influential voices. Brian: An excellent compilation that will spark conversation and thought. My students have been reading the Solis/Breakenridge book this semester; this has now been added to their “required reading” list. Many thanks. Ellen, thank you. That's wonderful news…I hope it helps! Well laid out, Brian. It's here whether we like it or not. I think the “Magic Middle” splits into the mid-influence generalists and the domain experts. Somebody like Robert Scoble, who is a great guy, has little influence in my area of technology. But we do have our own A-list, who would be considered smaller bloggers when viewed from the mainstream. And as to the blurring of boundaries: at our recent conference, we had two slots for attendee roles in our registration system, which didn't really capture the partner/blogger/speakers, the analyst/blogger/speakers or even the customer/blogger/journalists! How do we divide & conquer? For now, most people still have a primary affiliation – blogger, analyst, or press – and we go with that. We do a lot of cc-ing. Great insight, Brian. I could not agree more on this: “…each new connection requires management, a support infrastructure, including a dedicated host.” I see the “dedicated host” as a very important variable in the equation of customer relationships. Being accessible and responsive is the key here in my opinion. sourced from a feed. OK? But, but. but .. everybody's all over the use of social media to communicate externally *reach out to those customers and reel 'em in), and all the silo-bustin' communications within enterprises .. well, that's moving slower and taking a while longer, no ? Interesting post, Brian. What if you were really to rethink influence – from something that humans to do/or exert over each other to something we choose to accept from each other? From a push to a pull phenomenon? Now that would create a revolution in PR, wouldn't it? Thanks for the interesting post, Brian. In terms of PR’s role (and we could lump marketing, advertising, etc. into the mix), I think we need to start positioning ourselves for a potentially bigger trend: other lines of business eventually absorbing key facets of social media. We can't assume that communicating externally will forever remain the domain of PR. I believe that as the material benefits of the medium become more apparent to business, specific parts of the business will inevitably want/need to take the reins. Sales, customer service, HR, product development – these groups won’t just cede leadership of those functions to PR if social media is viewed as central to executing their mission. Increasingly, they’ll figure out how to harness and then own social media in the ways they see fit. Clearly there is a big window for PR to play a significant role as educator and facilitator. But I do think PR needs to aggressively push its way into all aspects of business at a deep level (not simply evolve PR) to retain a leadership role in social media. This is both a big opportunity and potentially a big threat.